As sound or light propagates, the Doppler effect is the perceived change in the frequency (or wavelength) when the observer and the source of the wave are moving relative to one another. For sound waves, the pitch of an approaching object, say the roar of a train, decreases noticeably as the train passes an observer. 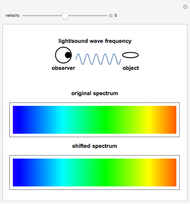 The Doppler effect is also exhibited as a shift in the frequency of known spectral lines emitted by distant stars. 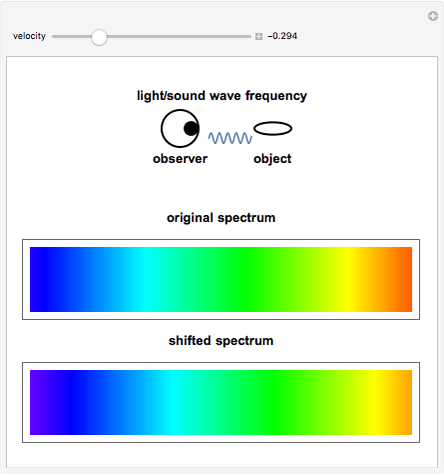 Due to the expansion of the universe, distant galaxies move away from us at a speed proportional to their distance from us, so that the Doppler red shift can be used as a measure of those distances. This was largely the discovery of the American astronomer Edwin Hubble in the late 1920s. 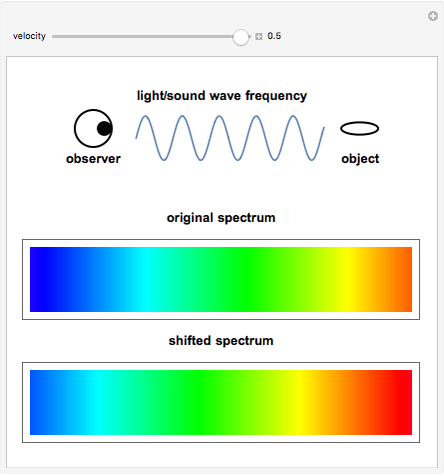 A fairly good approximation for the frequency shift in the optical Doppler effect is given by , where is the observed frequency of a spectral line moving at relative velocity with respect to the observer, is the speed of light, and is the frequency of the emitted radiation as measured in the stationary source. This Demonstration simulates the red shift in the frequencies of the visible light spectrum for recession (positive relative motion) and the blue shift for approach (negative relative motion).